it's a crowded market but if anyone can make something really stand out these guys can. I love their work. Never heard of The Goon, but here's hoping. Blur has an astounding range of design styles at its disposal. I wonder what kind it will use? I found this article which suggests that the producer has five other projects in the pipe already, (one with the involvement of the "Gopher Broke" director,) so possibly Blur may not get its turn in features for some time. Whats interesting here is the progression. From game animation to feature films. If only some locals would follow the lead. Don't forget the short films in the middle of that progression... in my opinion that's the clincher: stories with characters. All too often, game animation requires little or no acting. 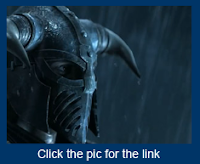 Even in these fantastic examples of game cinematics, the emotive range consists of "grr". The coolness comes from the design, the detail, and above all the over-the-top action, not the character animation (beyond being physically convincing). I don't believe that your average gamer expects, or even wants, more than lip flap from their game actors. As the age of your average gamer increases, I hope that they will become more demanding... it hurts to see so many talented animators working in games, and never being permitted to hone their acting craft. As for hoping that local games studios move into feature films, baby steps, Ian. One neat idea which I have encountered is that of using game assets to create short films: there's machinima of course, which is recording gameplay and then editing it into a story, but there's also this interesting little company. They are making a TV series out of game assets, but doing it by hiring artists to add specific animations etc. to tell the story properly. I will be very interested to see the result. THE GOON is published by the company that also does HELLBOY, and it's a great series. Artist Eric Powell has a really distinct style that should lend itself beautifully to animation (I think he was an animator in a past life). Check some of it out here - http://www.darkhorse.com/Zones/Goon. I watched Gentlemen's Duel. I thought I was watching it again but realised that the stuff I watched before was just some previews. What a great fun short film. It's good to see an animation that knocks a student out of animation analysis mode. I know! I'll stop typing so I can get down to some serious procrastination. I just looked at a few pages of The Goon. It's really good. Great graphics. Not much reading. And what reading there is, is very witty. I reckon Zac and Steve, in particular would like it. Terry, have you got a couple of issues that you might free from the vault to bring into class?